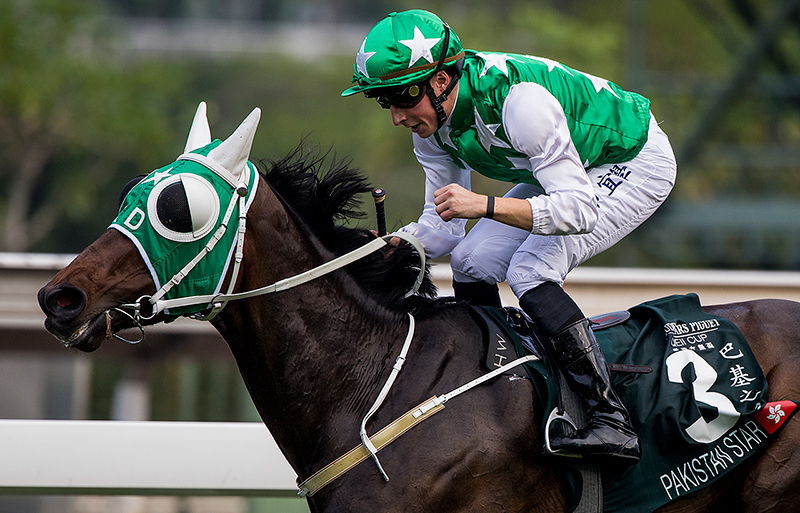 Pakistan Star pulls off a sensational win in the Audemars Piguet QEII Cup at Sha Tin today. 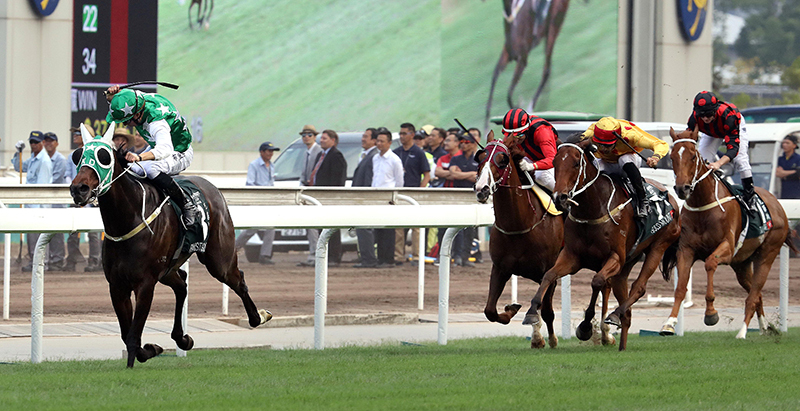 Hong Kong’s wayward son came of age at Sha Tin this afternoon (Sunday, 29 April), and oh, how the crowd loved it. Pakistan Star smashed his rivals in the G1 Audemars Piguet Queen Elizabeth II Cup (2000m) with a performance of uncomplicated superiority. “He’s blown them all away,” trainer Tony Cruz said after the five-year-old had surged to a three-length victory in a fast time of 2m 00.21s, the second-fastest, in fact, in 22 renewals at the race’s current distance. The Sha Tin faithful – never shy in displaying their ire, as Pakistan Star knows only too well – this time gave the Shamardal gelding a roaring reception. William Buick, a late call-up for the ride, lapped every cheer as he and the green-hooded hero returned to unsaddle. Buick replaced Australian Kerrin McEvoy – laid low with an ear infection at Hawkesbury races on Saturday – who was booked after first choice Silvestre de Sousa was required to remain in England. “I obviously feel sorry for Kerrin McEvoy, it was his intended ride and I’m just lucky to jump on him,” Buick said of the 4.8 chance. “I’m very fortunate that I got the ride and it was a very nice surprise for me when I landed in Hong Kong. Pakistan Star shows his terrific turn-of-foot to win today’s Audemars Piguet QEII Cup. Fast is how it looked from the stands, too, just as it had back in July, 2016. That was when the Hong Kong International Sale graduate first set alight horseracing’s little corner of the worldwide web with an incredible last-to-first win. Since then, Pakistan Star’s story has been one of frustration and angst, littered with moments of unrewarded brilliance: a near-miss second in last year’s QEII Cup, a refusal to race, and seemingly umpteen barrier trials to prove to the racing stewards his suitability to race. Owner Kerm Din appeared to be as relieved as he was pleased at the moment of triumph; Cruz, ever assured, looked on proudly as his previously wayward charge returned. Pakistan Star gets his maiden G1 success in today’s 2000m major feature. Buick made up for an unplaced run in the afternoon’s previous contest. That was atop Blue Point in the G1 Chairman’s Sprint Prize (1200m) for Godolphin, his only other ride aside from his first-time liaison with Pakistan Star. “He’s quite a famous horse for his antics so I was aware of him and I was aware of what he can do,” Buick said. “I took on board all of the information I knew about the horse and also thought it was quite important to ride him with a fresh mind and just be very positive about the horse. “Tony did say he’s not a horse you can bully into doing things, you have to treat him with kid gloves and make him want to do it, rather than make him do it. He never gave me any kind of indication that he was going to do what he has done in the past. Those stars included stablemate Time Warp, winner of the current Hong Kong season’s two previous Group 1 contests at the distance. That rival set the tempo, harried along by Japanese raider Danburite, as Pakistan Star stalked one spot back. Pakistan Star poked between the flagging lead pair 300m out and responded to Buick’s driving with a brilliant turn-of-pace. Clear within a handful of strides, the German-bred careered away from runner-up Gold Mount (33/1) – another Cruz-trained galloper – with Eagle Way (21/1) third and BMW Hong Kong Derby winner Ping Hai Star (2.6) fourth. 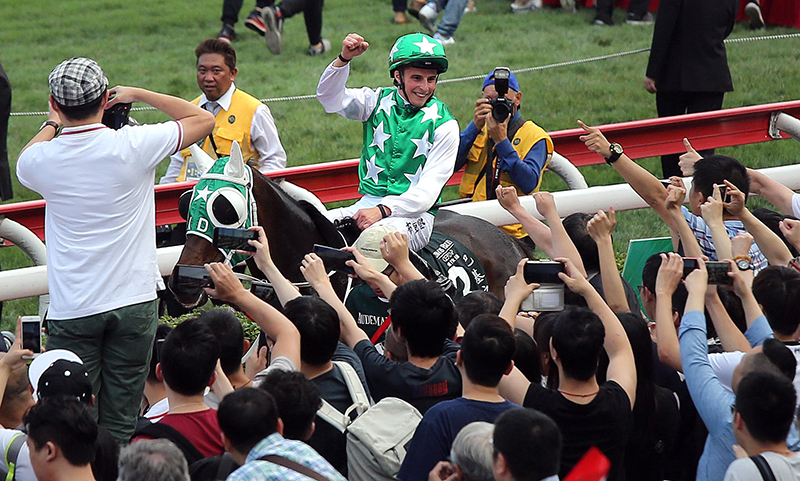 Jockey William Buick celebrates his success with the Sha Tin crowd after the race. Cruz is looking to the G1 Champions & Chater Cup over a mile and a half next month, but revealed that he is also considering overseas options for his charge, who has raced only four times this term. “The Champions & Chater is the only race for him here, so I’ll work out with his owner where else we might take him – Royal Ascot or something. He needs racing, he’s only had four races – he’s had more barrier trials! “He’s taught me a lot, how he thinks – he’s got a racing mind now, he wants to race. He’s much more professional now and he’s improving all the time.” Cruz added. Japan’s 2017 G1 Satsuki Sho winner, Al Ain, finished a sub-par fifth, one place ahead of Dinozzo, as Danburite and Time Warp, the 2.4 favourite, faded to the tail.